Our single phase transformers are all custom built in the UK. 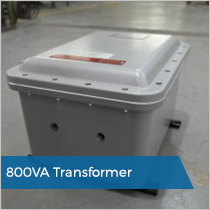 As a leading transformer manufacturer our capabilities allow us to manufacturer transformers from 50VA up to 150kVA. 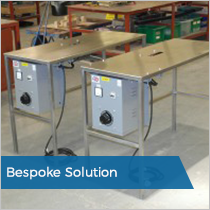 Our electrical technicians provide design and manufacturing services to a range of industries. 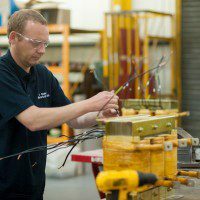 We are at the forefront of transformer design and manufacturing in the UK. We are proud to be an independent British company who is celebrating over 35 years in business. Additionally to manufacturing, we also have the ability to repair and rewind transformers up to 500kVA range. Our electrical team can assist with designing, modifying or reverse engineering to your requirements. R Baker (Electrical) Ltd manufacture single phase transformers for a range of applications. Our team has a vast amount of experience with commercial, rail, offshore and military requirements. Through experience and innovation we are able to offer bespoke transformer solutions for one off projects through to batches. We are proud to be able to offer the best transformer design and technical advice in the UK. We have supreme confidence in our manufacturing team’s ability to include you in every step of the manufacturing process. We can supply design data, technical information and CAD drawings when required. This ensures that we provide you with the finished product that will meet your needs exactly. Our in-house transformer rewind and repair team provide a fast and reliable service across the UK. R Baker (Electrical) Ltd are uniquely positioned in the UK as one of only a few companies that offer this service. Our transformer facility is well equipped to handle all emergency and non-emergency repairs. Our team are here to help, regardless of brand or application. We have a vast amount of experience reverse engineering damaged or obsolete transformers. We are proud to offer free advice if you have a single phase transformer that needs rewinding or is damaged. We value our customers and try to build long-lasting relationships, based on trust and value. We aim to issue quotes within 24 hours whenever possible. Call us on 0151 486 6760 for transformer rewinds. 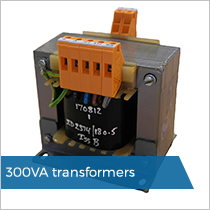 Our transformer range can be supplied with or without an enclosure. 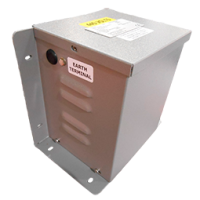 If an enclosure is required, we will supply transformers suitably protected by a sheet metal case which is wall mounted or floor standing. We also construct enclosures from stainless steel or aluminium to meet your specification. For customers who operate in hazardous area zones, we can supply ATEX enclosures suitable for gas and dust environments. Our standard cases are IP23 but we can supply up to IP66 if required, usually with little or no addition to lead-time or cost. As a one of the leading transformer manufacturers; we were tasked by our customer to manufacture a military style 330VA single phase transformer. The transformer was designed to isolate and step down the incoming voltage from 230/115v, to 24v. Due to this having a marine application the transformer was enclosed in an IP23 case as specified in the design. Our customer required a solution to increase production within their foam packing business. We worked with the customer to develop and manufacture a single phase variable transformer which was designed to be installed on a stainless steel table. This solution was designed for heavy usage and to reduce cutting time when cutting foam sheets. The final solution was such a success the customer ordered two more; due to an increase in orders they received, from being able to maximise output from the cutting solution. Our transformer team have a vast amount of experience in designing and manufacturing ATEX transformers for use offshore. Our client required a custom built 800VA single phase transformer to be used in a hazardous area. The transformer was utilised within a control panel and had specific size restrictions. As one of the leading Transformer Manufacturers we were able to use our in-house design software to reduce the size and heat rise of the transformer to ensure that it met the size restrictions. The transformer was to be supplied with installer’s declaration, internal layout drawings, photographs of components, BOM and certificates for ATEX and IECEx standards. R Baker (Electrical) Ltd is based in Speke, Liverpool. The facility is equipped with the latest winding machines and testing equipment to accommodate the various types of transformers that we manufacture and repair.